March 2017: a very new ski emerged in Austrian Alps. A pair of short curved blades was mounted along the ski edges. Just to carve the ski turns better than long edges of all today`s skis. The worldwide publicity is starting just now. founded on Austrian Rax Alpe in 2006. Dreaming of a new ski which lets you enjoy every terrain and snow conditions. like the fins of a surf board or the runners of an ice skate. All this was nothing but a heresy in the eyes of many ski experts. The experience as well as the critique by these several hundreds skiers from four continents became the motor of further development. 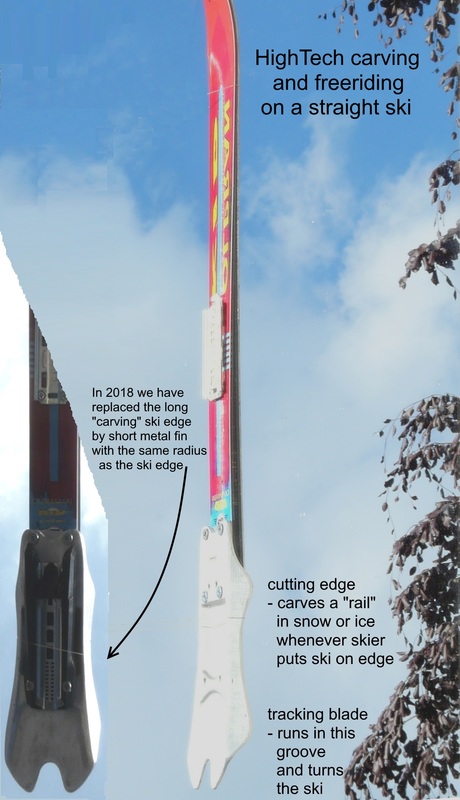 In March 2017 a big bang suddenly happened on our way: short curved blades, mounted along the ski edges just underneath skier`s heels! To carve the ski turn, the front part of the blade acts like a cutting edge, while its rear part executes the required turn. This is how the function of the standard „Carving Edge“ was replaced by two specialized devices: the „Cutting Edge“ is just cutting a „rail“ in snow or ice, the following „Tracking Blade“ is running in this groove and turning the whole ski. Because the Blade is bent like the the parabolic edge of all modern skis. We named it High Tech Carving.